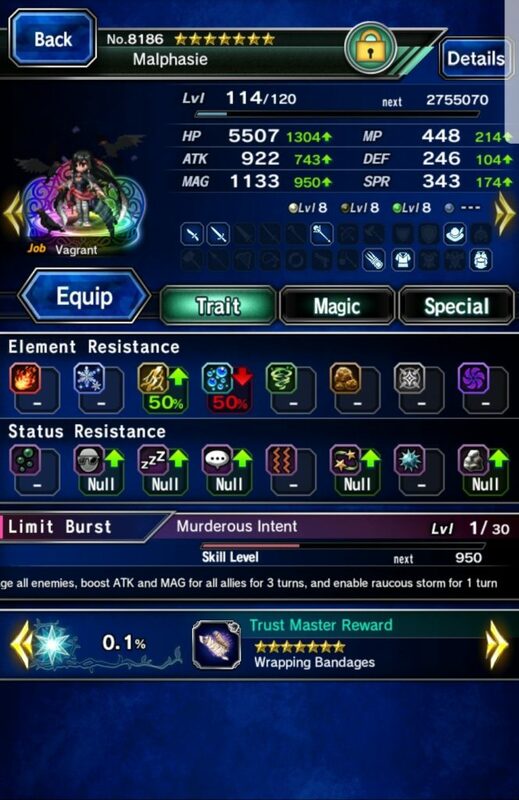 FFBE Gacha Stories: Got a Malphasie off-banner! I was expecting a Lilith (a physical and magic tanker from Final Fantasy Brave Exvius’ Halloween Banner with some offense) and to my surprise, I got Malphasie. Malphasie is one of the baddest units in FFBE because she is a physical and magical hybrid offense unit that belongs to a multiple chaining families (Tornado, Divine Ruination, Aureole Ray). Hybrid units are a must especially when you have enemies that can have alternate immunities against physical or magic attacks. Based from the picture, I will max it out first before I will have her decimate all enemies in the Chamber of the Fallen, Indignant, and Arms. By the way, my Hyoh will be happy for her new chaining partner, as well as my Fryevia.